Chances are, traditional Mongolian foods are totally unlike what you imagine them to be. Taiwanese, Chinese, and American Mongolian Barbecue and Mongolian hot pot chain restaurants have done plenty to influence the global popular imagination of what Mongolian food is all about. Let me tell you, the reality of Mongolian food culture is quite different that what you can find at your local hibachi buffet. Visitors to Mongolia actually often have trouble with traditional Mongolian cuisine upon arrival. Meat, when it is used (which is always), is fattier and more gamey than what many in the States and Western Europe are used to. And the other half of the Mongolian food pyramid, dairy, consists of cheeses, milks, and even occasional alcoholic fermented milks that are generally a bit more gamey and sour than many can appreciate. This often leads to flat-out disdain toward Mongolian foods. That said, Mongols take great pride in their foods, and honestly, once you get over “a bit gamey” and “a tad sour”, traditional foods in Mongolia can be very tasty, and dare I say it, even outstanding. But, like greasy diner-type restaurants (i.e. “dives”) elsewhere in the world, you might very well get an off night with something truly bad. Fortunately, more and more, dinner option meals (at least in Ulaanbaatar) are getting more regularly flavorful and satisfying. 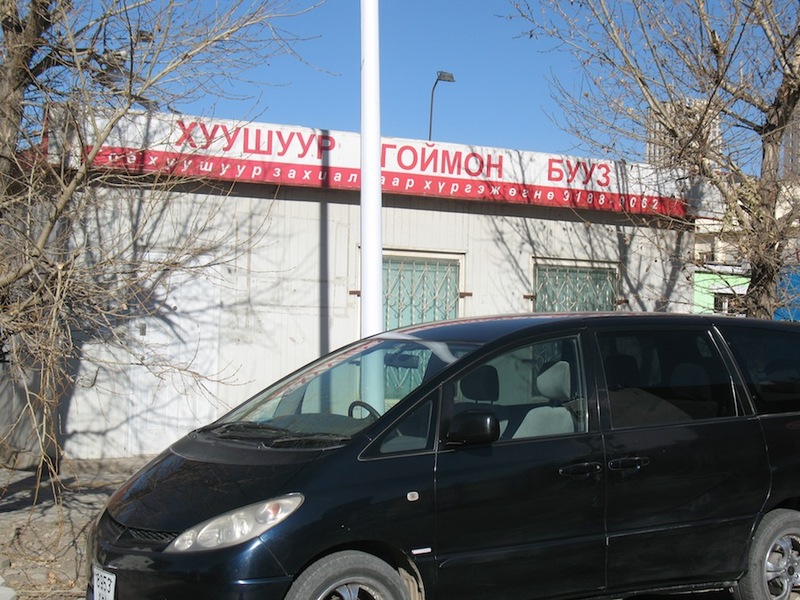 New Mongol chain operations have been forming empires in Mongolia since private enterprise was a possibility. 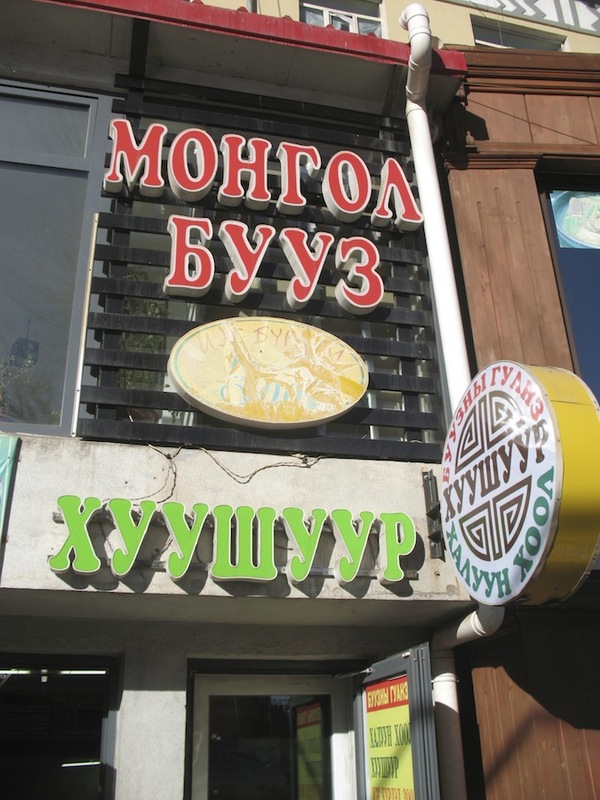 If you visit Ulaanbaatar nowadays, you will see [Modern] Nomads and their subsidiary Grab & Go all around the city, offering elevated forms of traditional Mongolian dishes, as well a quick fixes when you are on-the-go (the Nomads’ symbol is an artist’s rendition of the cap of a traditional Mongolian dwelling, the ger). 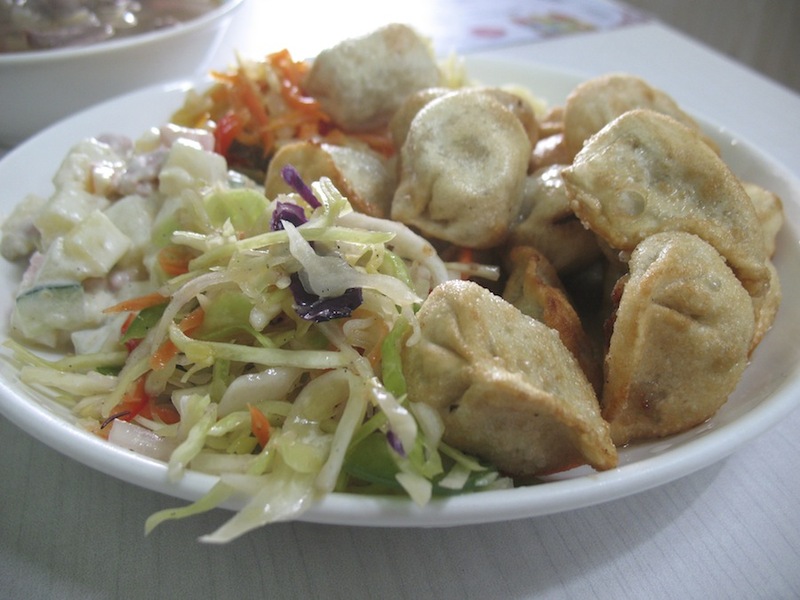 There is also the 24-hour Khaan buuz chain, that can satisfy your dumpling fix. Other chains are also rising to fill particular niche markets, including traditional greasy foods with beer, like the Zochin Mongol group (where I took my “fried noodle” pic below, as well as many other new chains. 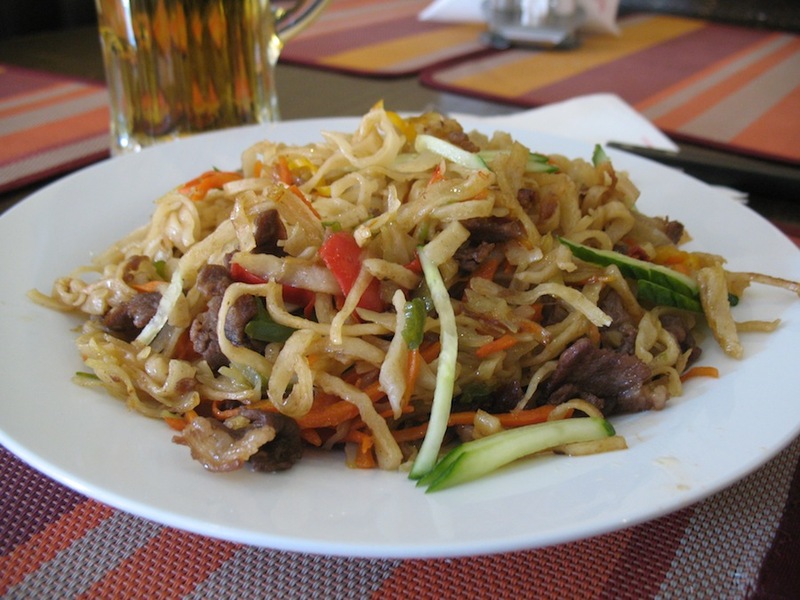 Very generally speaking, Mongolian food is very heavy on the meat-and-starch. Meals tend to be boiled, steamed, and more occasionally fried and roasted. Vegetables are used, but mostly as ornaments. Aside from salt and onion, spices and other aromatics are not commonly used. These observations lead to typical criticisms of Mongolian food by visitors. Strangely though, those flavors are quite similar to many diets around the world, including where I grew up, in rural Wisconsin. For example, potatoes, carrots, and cabbage were the primary “vegetables” alongside main courses of non-spiced steak, roasts, or stews. How can we criticize? I am reminded that in our country, regulatory agencies even count ketchup as a vegetable, in order to keep meat and starch as nutritionally “balanced” meals for schoolchildren in many parts of the US. Mongolia has some similar issues with that. Nowadays in Mongolia there are actually public health campaigns encouraging people to eat green vegetables. Unlike Wisconsin, Mongolia’s landscape is quite inhospitable to most vegetables. But greens are grown successfully in a network of greenhouses, and literally tons of vegetables are imported from China and elsewhere on a daily basis. While most Mongols seem to appreciate meat-and-starch over other foods, every time I go to Mongolia I am pleasantly surprised at the new food trends. The bar keeps getting kicked ever higher, with surprising imports from around the world and with supercharged entrepreneurial domestic produce in that landlocked country. More and more, cabbage and lettuce varieties are included in meals, spinach and Chinese long leaf veggies are also becoming staples. Kimchi is practically a staple (as is hinted at my post on Korean UB), and you can even get fresh herbs at many of the major markets: basil, cilantro, and mint. 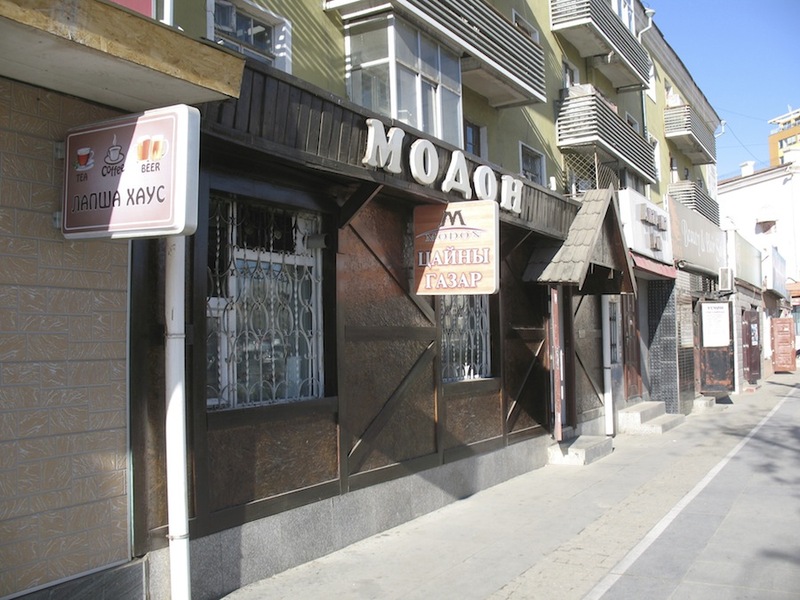 Back to classic Mongolian diner food… Below are some images of typical Mongolian “greasy spoon” restaurants (i.e. places that might be likened to American “dives” and “diners”). These are places that sling out greasy home-style meat-and-starch meals, the likes of which mom, or possibly grandma, used to make. I have to say… I really enjoy these places, largely the same way I enjoy down-home American diners. It’s just regular people (with the occasional inclusion of those from higher and lower echelons of society), getting a quick fix on some basic comfort foods. Think mac ‘n cheese, but without the processed foods and without the preservatives. 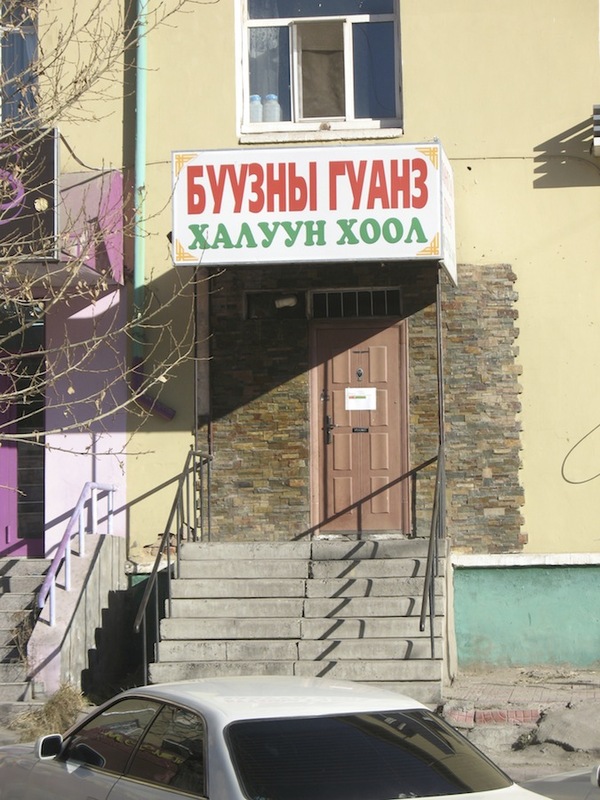 These kinds of restaurants are known by different names in Mongolian, with varying degrees of formality. 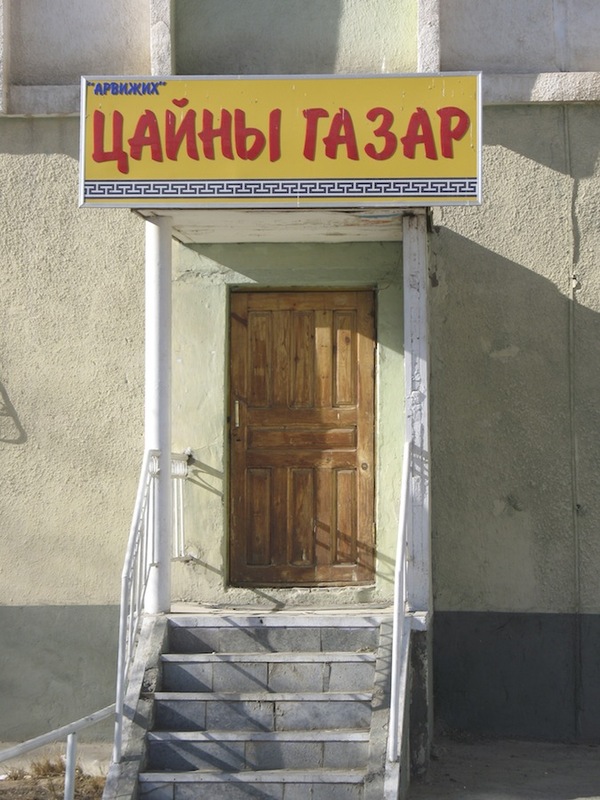 The most basic of dives are called гуанз/”gwanz” or a цайны газар “tsaynee gazar”[tea house]. A slightly more formal setting (serving similar dishes) might be called a “dinner house” or “banquet house” зоогийн газар “zoogeen gazar”. 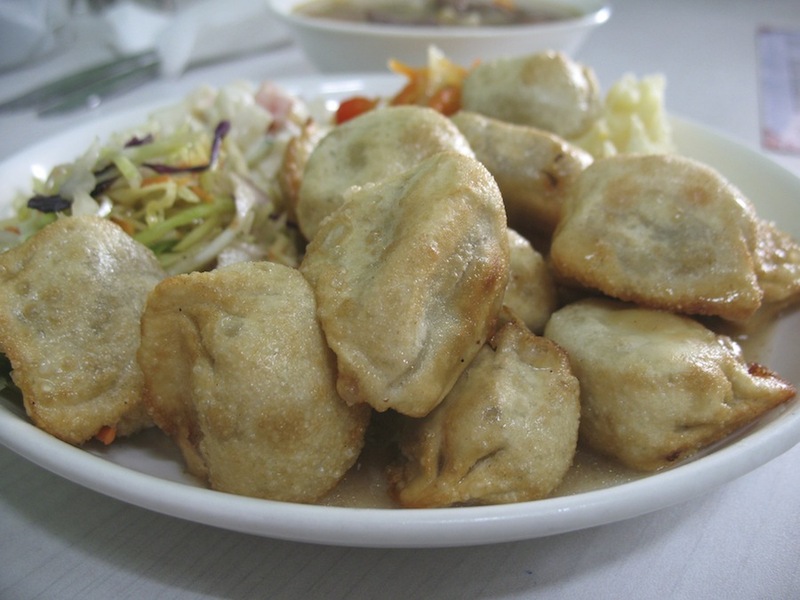 Restaurants may also be themed “dumplings” or “fried meat pies” as specialties (like the pic to the left). 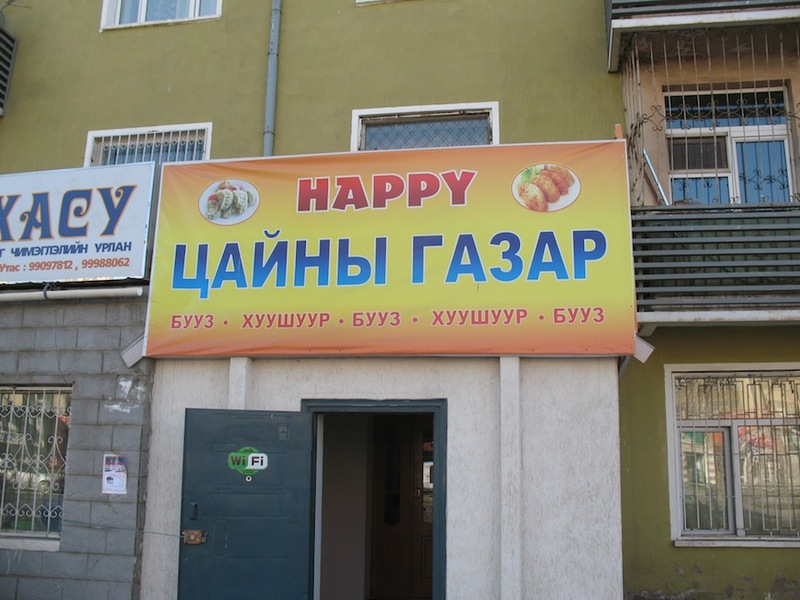 “Happy” Tea House: buuz, huushuur, buuz, huushuur, buuz. Бууз “buuz” (pronounced “bōz”)- these are steamed meat-filled dumplings. Similar foods can be found from Japan all the way to Turkey and the Mediterranean. Buuz skins are usually a little thicker than what you might find as wrapped dumplings at Chinese dim sum places, for example. This is an important dish to Mongols, and it is largely used as a celebratory food. They tend not to eat them with sauces or dips. The filling meat is usually mutton, onion, salt and pepper. Шөл “Shol”. Soup. 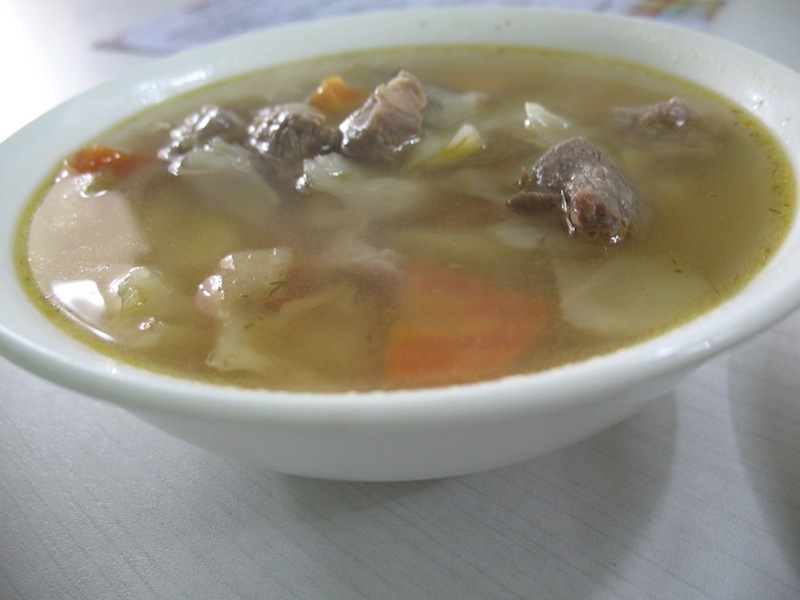 This can vary widely, but it is always a meat broth, with occassional additions of noodles, carrot, potato, cabbage. 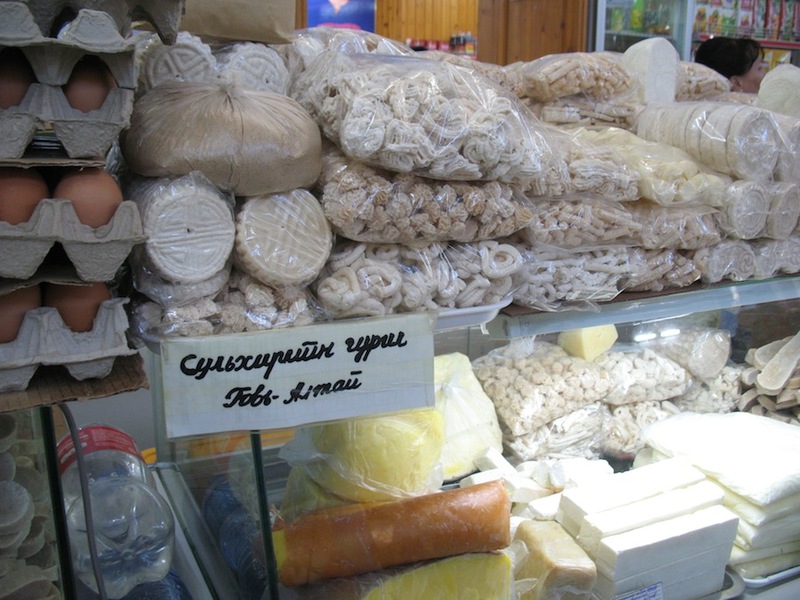 I am missing a key photo of the other very typical go-to food, хуушуур “huushuur”. These are much larger, flat meat pies, that are deep fried. See here for an image of huushuur on BuffaloEats. Christian Wild also has some nice images on his travel blog. Note: if you ever travel to Inner Mongolia, and you are looking for these kinds of restaurants, look for “Milk tea house” 奶茶店. 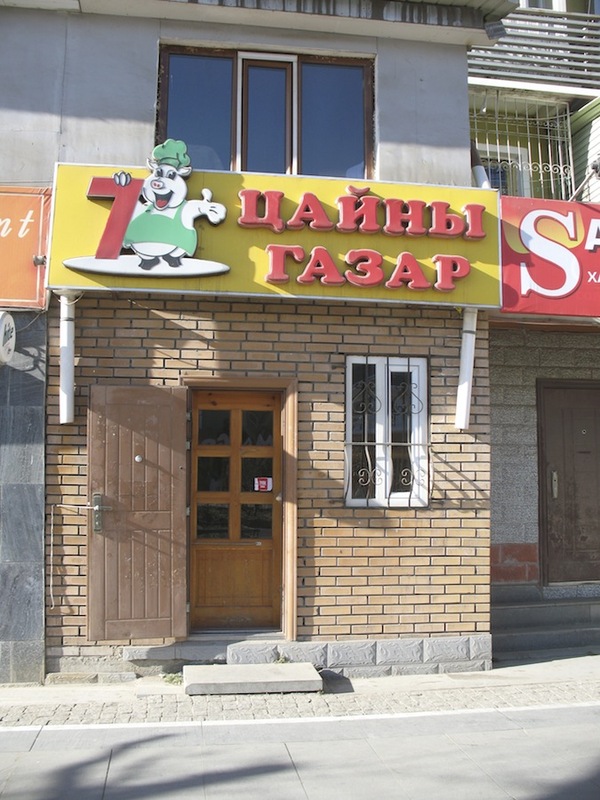 Otherwise you might assume the only Mongol restaurants are the big tourist ones. 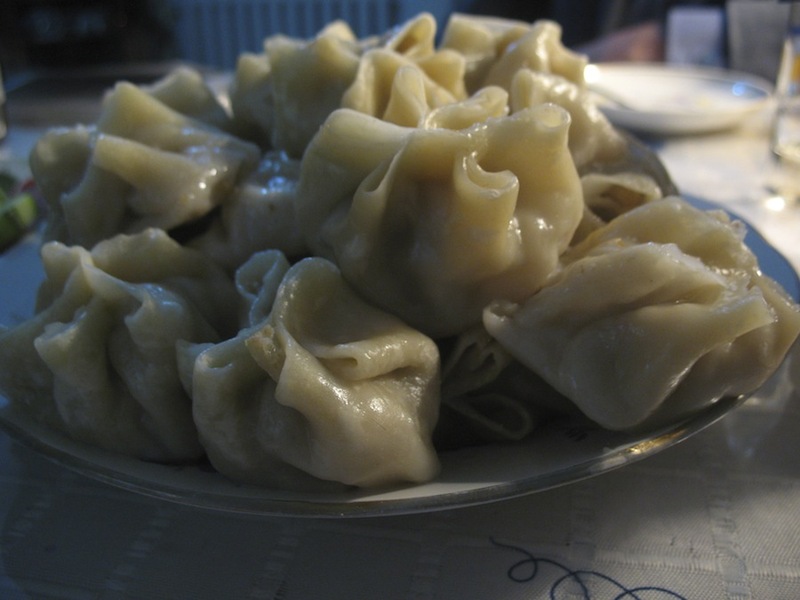 This entry was posted in - Featured Food Discoveries, - Guides, - Unique food traditions, Mongolian food and tagged diners, dinner houses, Монгол, банш, бууз, гуанз, 蒙古炒面, 蒙古炸肉包, 蒙古包子, 蒙古国, greasy fare, meat pies, Mongolian, noodles, халуун хоол, хоол, Ulaanbaatar, 乌兰巴托. Bookmark the permalink.